Memories of my first trip fifty-five years ago have become vague, with the exception of a few occurrences which were etched in my mind and some of those I mentioned in my last posting about the first two days of the trip. 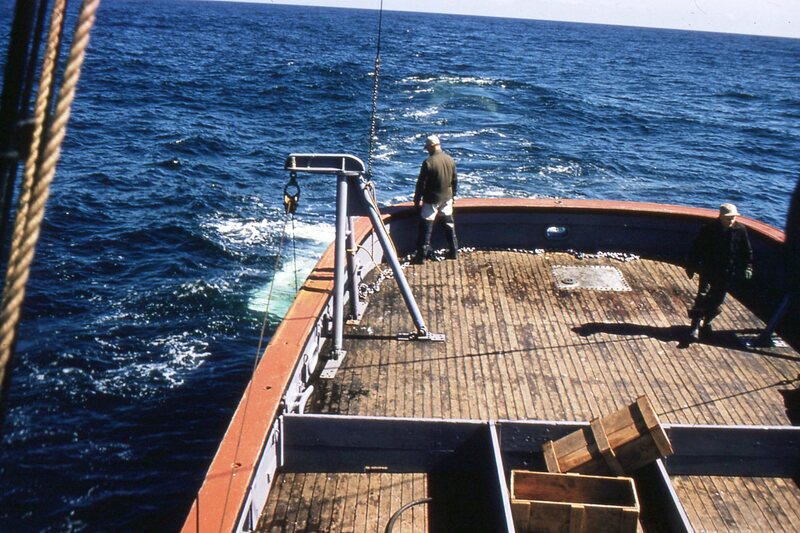 Recently I found a number of color slides showing the setting and retrieval of the trawl. The process had fascinated me ever since I heard Lee Alverson’s lecture in 1958 at the College of Fisheries, when he spoke about his recent trip to Germany. He indicated that there was a major change occurring in the distant water trawl fleets of the world – the introduction of stern trawlers which would make the side trawler obsolete. I left the lecture wondering why this hadn’t happened before, since the Pacific coast trawl fleet had been stern trawling for years? When I went out on the Commando to collect rockfish samples for my research I was involved in the actual trawling, running winches and hooking up and releasing trawl doors, but didn’t pay much attention to the process, being more interested in the end results of the tow and how many rockfish were in the catch. 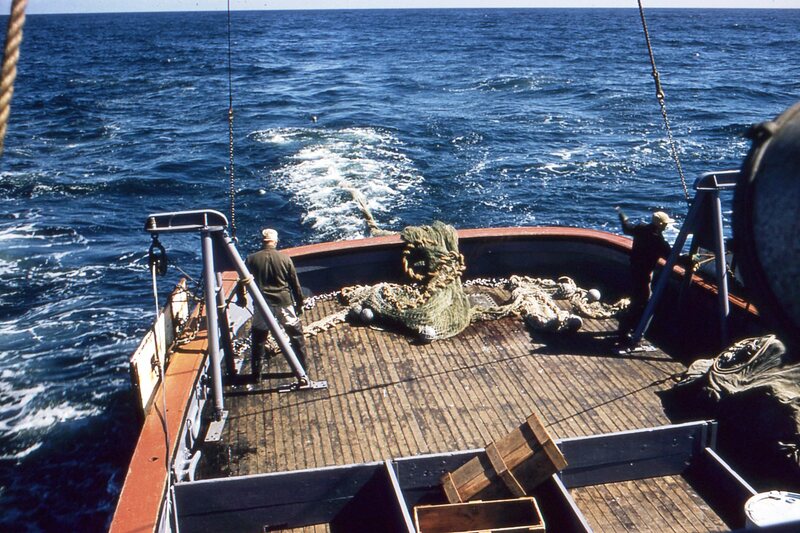 When I was hired by the Exploratory Fishing group on July 5, 1960, and went on my first trip on the R/V John N. Cobb on August 15, 1960, I had time to understand and observe the process of setting and retrieval of a commercial trawl and to photograph the procedures. Deciding where to make a set was an important decision, because the ocean bottom is not all smooth and flat as it was in Port Orchard where I did my study and there was danger of hanging up on an obstacles that could damage the net or lose it. 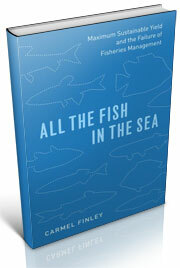 We were working in an area that commercial fishermen considered untrawlable. 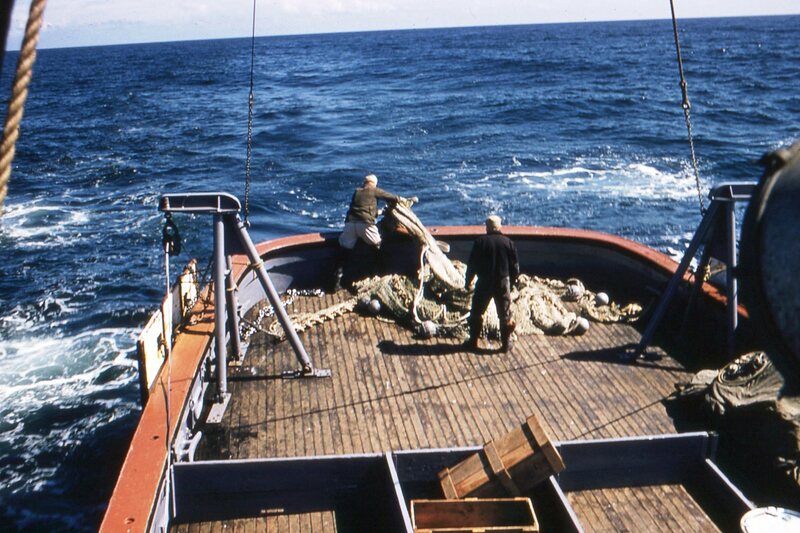 Considerable effort had already been expended to find suitable bottom, and this was the final stage to determine what species were available and whether a haul could be repeated without losing the catch or damaging the trawl. The skipper lined up the vessel on a depth contour and gave the command to set the gear. The pictures included here are of the setting. The first one is of Arnie, one of the fishermen, heaving the cod end over the stern so the water could take it and pull out the net as the vessel moved forward. The second picture shows the rest of the net going overboard and the third is cable from the winch running freely through the block as the net is let out. The fourth shows where the doors have taken the strain after the “jam link” has become engaged with the “Figure 8” hanging from the after part of the door and the pull of the net is transferred to the door which is held in place by a chain that is hook to the stanchion. 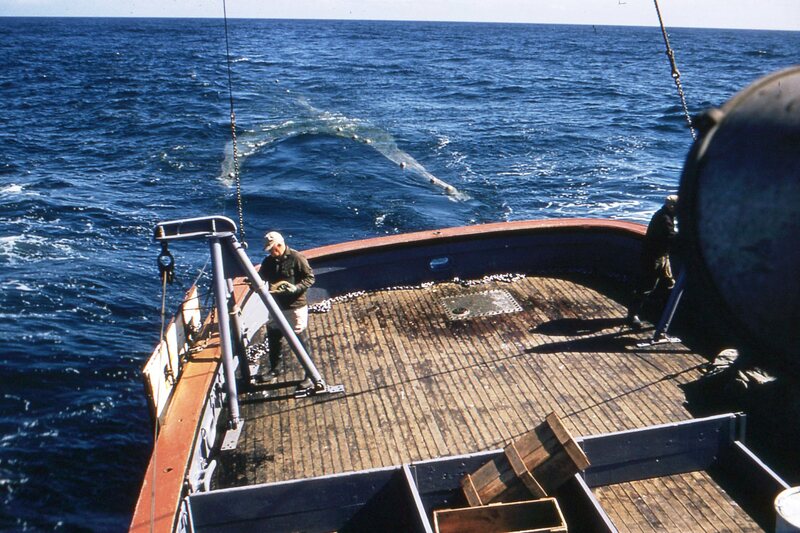 This is the point where fisherman Arnie on the starboard side and Connie, on the port side, connected their individual trawl door to the main cable by attaching the slack flat link at the end of the trawl cable to the G-hook hanging slack from the door, sliding the open slot on the G-hook through the grove in the flat link joining the doors to the trawl cable. This is where I believe a drawing helps and I have taken the liberty of modifying one that artist Boris O. Knake published in Fishery Leaflet #445 in 1958. He is the person who accompanied the Deep Sea on her first two cruises in 1947, and again in 1948.In the publication he made a drawing that shows the hardware and how it’s arranged for a trawl door on an east coast side trawler. The arrangement is similar to that used by the Pacific trawl fleet, the only difference being the placement of the stanchions on the stern instead of on the side of the vessel. 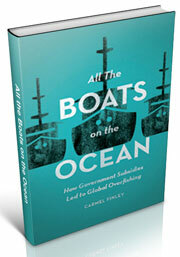 The nomenclature differs and I have replaced it with what I was familiar with on the Cobb, a Pacific coast vessel. Once the trawl doors are attached to the main cable the winch operators pull the trawl door up into the trawl stanchion, shifting the pull of the net to the main trawl cable as shown in the fifth picture. 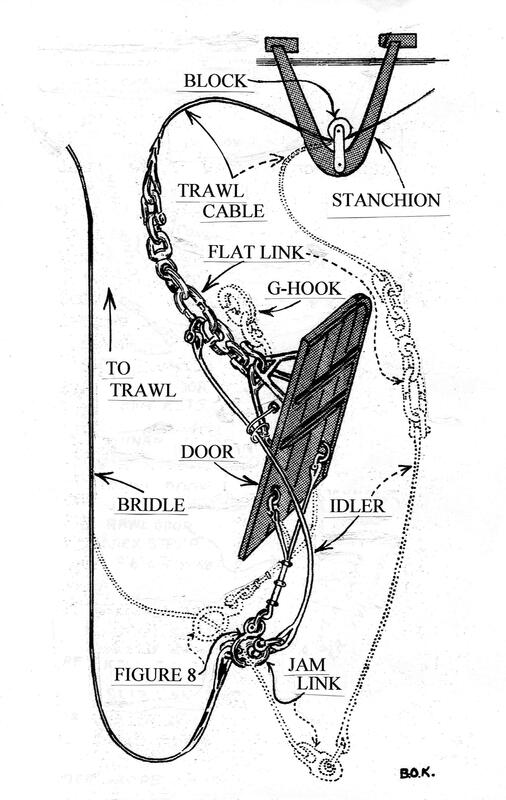 The chain that connected the trawl door to the stanchion becomes slack and the hook can easily be released. I did the same thing on the Commando. The forces are great on the trawl doors as the vessel slowly moves through the water, and I must admit it was stimulating to connect and disconnect the flat link and to hook and unhook the doors. Finally, in the sixth picture the doors are in the water and brakes will be applied to make sure that the doors shear out to the sides of the vessel. Cable is then let out by each winch operator at the same rate, according to meters on each side, with the winch operators calling out their readings to ensure that both sides of the gear go down evenly. 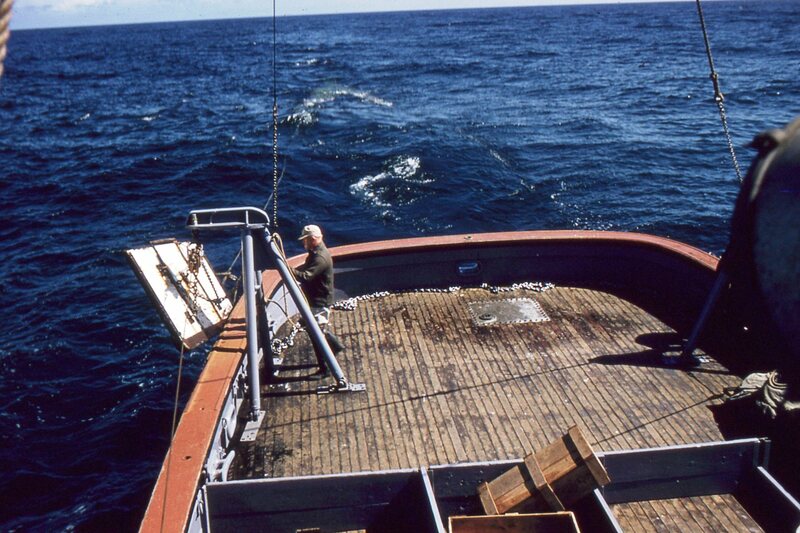 A sheet of paper in the pilothouse, referred to as a scope table, gives the length of trawl cable needed for a specific depth interval. Once the depth is defined for a drag the table shows the amount of trawl cable needed, and when the trawl winch operator reaches that amount the winches are stopped and the brakes are set. The net is towed along a specific depth contour for an hour before it is retrieved. The Pacific trawl fleet has been stern trawling for years and the new vessels that Lee talked about set their trawls in a similar manner as the Cobb. 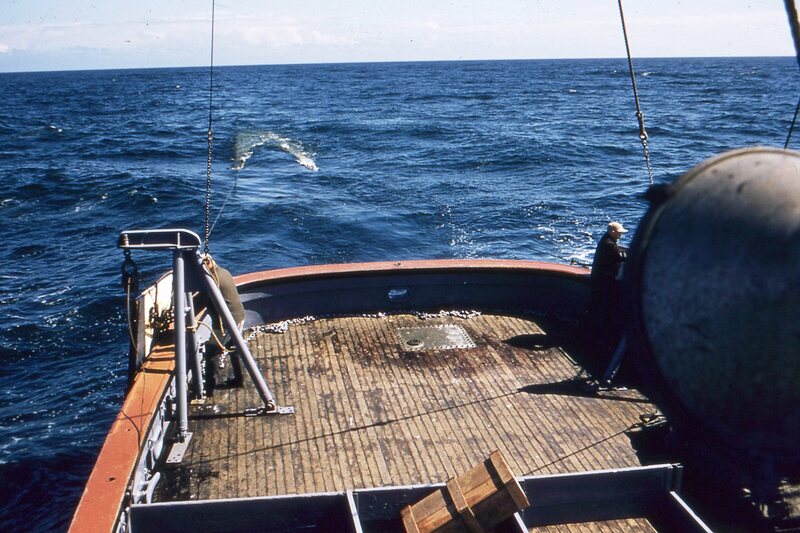 The difference is in how the fish catch is retrieved, which made the side trawler obsolete in the distance water fleets which I will discuss in a future posting on Retrieving The Trawl – My first Cobb trip. 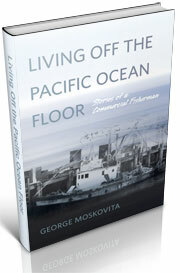 This entry was posted in boat building, Dayton Lee Alverson, Environmental History, Exploratory Fishing Base, fisheries science, Fishing, History of Science, History of Technology, Maritime History, Ocean fishing, Pacific Fishing History Project, R/V John N. Cobb, Sebastes rockfish and tagged Bob Hitz, Boris O. Krake, groundfish, Pacific Fishery History Project, Pacific fishing boats, Pacific Ocean Perch, Sebastes, side trawlers, stern trawlers, trawl doors, trawl net, University of Washington. Bookmark the permalink.